Dust Storms on Mars - Universe Galaxies And Stars Section. Electrical Dust Storms Could Make Life on Mars Impossible. 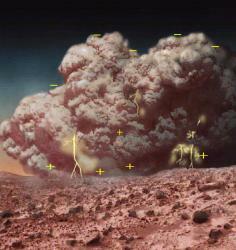 Artist impression of electrical storm on Mars. Image credit: NASA. New research is suggesting that planet-wide dust storms on Mars could create a snow of corrosive chemicals toxic to life. These Martian storms generate a significant amount of static electricity, and could be capable of splitting carbon dioxide and water molecules apart. The elements could then reform into Hydrogen peroxide molecules, and fall to the ground as a snow that would destroy organic molecules associated with life. This toxic chemical might be concentrated in the top layers of Martian soil, preventing life from surviving. Based on field studies on Earth, laboratory experiments and theoretical modeling, the researchers argue that oxidizing chemicals could be produced by the static electricity generated in the swirling dust clouds that often obscure the surface for months, said University of California, Berkeley, physicist Gregory T. Delory, first author of one of the papers. If these chemicals have been produced regularly over the last 3 billion years, when Mars has presumably been dry and dusty, the accumulated peroxide in the surface soil could have built to levels that would kill “life as we know it,” he said. “If true, this very much affects the interpretation of soil measurements made by the Viking landers in the 1970s,” said Delory, a senior fellow at UC Berkeley's Space Sciences Laboratory. A major goal of the Viking mission, comprised of two spacecraft launched by NASA in 1975, was testing Mars' red soil for signs of life. In 1976, the two landers aboard the spacecraft settled on the Martian surface and conducted four separate tests, including some that involved adding nutrients and water to the dirt and sniffing for gas production, which could be a telltale sign of living microorganisms. “We are trying to look at the features that make a planet habitable or uninhabitable, whether for life that developed there or for life we bring there,” he said. “From our field work, we know that strong electric fields are generated by dust storms on Earth. Also, laboratory experiments and theoretical studies indicate that conditions in the Martian atmosphere should produce strong electric fields during dust storms there as well,” said co-author Dr. William Farrell of NASA's Goddard Space Flight Center in Greenbelt, Md. “The presence of peroxide may explain the quandary we have had with Mars, but there is still a lot we don't understand about the Chemistry of the atmosphere and soils of the planet,” he said.